The Atlanta Thrashers signed forward Nik Antropov to a four-year, $16 million deal. Antropov, 29, set career-highs on last year with 28 goals and 59 points in 81 games for the Leafs and Rangers. The Thrashers also re-signed forward Chris Thorburn and are executing their plan to fit coach John Anderson's up-tempo game. Adding another veteran forward may be enough to convince superstar captain Ilya Kovalchuk to sign a long term extension. The Los Angeles Kings finally were successful in signing defenseman Rob Scuderi to a four-year, $13.6 million contract. Scuds made the hockey world take notice last season with the Penguins with an outstanding playoff performance, including making a "save" to preserve a 2-1 lead in game 6 of the Finals. The Florida Panthers signed defenseman Jordan Leopold, who was acquired in the deal that sent the rights to Jay Bouwmeester to Calgary, to a one-year deal worth $1.75 million. The Carolina Hurricanes signed Chad LaRose to a two-year deal that will pay him $1.5 million in the upcoming season and US$1.9 million in 2010-11. LaRose, 27, had a career year playing in81 games, and scoring 19 goals and 31 points. 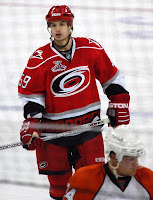 He was instrumental in helping the Hurricanes reach the Conference finals last season. The Toronto Maple Leafs re-signed RFA forward Mikhail Grabovski to a three-year contract averaging $2.9 million a season. Grabovski, 25, had an excellent first season, scoring 20 goals and 48 points in 78 games. The Boston Bruins have re-signed forward Mark Recchi to a one-year, $1 million contract. Surprisingly, the Phoenix Coyotes added another veteran signing defenseman Adrian Aucoin to a one-year, $2.25-million deal.